Whoo-WEE, things sure have changed in the 20 short years I’ve been doing appliance repair! The appliances themselves have changed from discrete mechanically-controlled machines to computers that do appliance functions. But the level of skill among technicians has changed, too. Somewhere along the way, essential skills like a working knowledge of basic electric circuits and using schematics to develop troubleshooting strategies have gotten scarce. In other words, there’s a critical shortage of Circuit Fu among appliance techs today. I have a background in electronics that I learned in the Navy. As a Navy avionics technician, I had solid training in basic electricity, circuits, electronics, and reading schematics. When troubleshooting a problem on a piece of avionics equipment, standard operating procedure (SOP) was to always pull the schematic and analyze it with the problem description in mind. When I started doing appliance repair 20 years ago, I used this same SOP with the much simpler appliance circuits that I troubleshot and it always served me well. Most of the older techs I met when I first started (many of them also military trained) did things the same way. It was no big deal. When we went to appliance training classes, it was mostly to learn about disassembly because the circuitry was so simple (this was long before the days of Youtube and PDF service manuals that could be downloaded from the Internet). Then I started noticing a change. The older techs who knew how to troubleshoot started retiring and the many of the newer techs (my age and younger) coming in to take their place didn’t have these troubleshooting skills. The situation deteriorated to the point that today, many techs never even look at the schematic because they don’t have the foggiest idea of how they would use them to troubleshoot. For lots of these guys, “troubleshooting” was reduced to simple pattern recognition, “Oh, yeah, I’ve seen this problem before and you need to replace this part to fix it.” But they have no idea why or how. The reason for this decline in skill is an interesting topic to speculate about and could fill up a whole ‘nother post. We all know that there are too many young people being diverted to an increasingly expensive and ineffective college track rather than the trades. And maybe that college-track focus in US high schools is part of why our apprenticeship system is weak and even those folks who do go into the trades are often not well-trained. Many people working in the skilled trades in America today are mathematically illiterate and have poor attention to details, especially important ones pertaining to their jobs. These deficiencies result in low job performance and satisfaction, and, ultimately, lack of achievement and success. This really is a lamentable situation because the skilled trades offer interesting, mentally-challenging, and, most of all, lucrative work. They also offer the most straightforward way to starting your own business. Customers also suffer because of the critical shortage of skilled, professional technicians who can come in, troubleshoot a problem, and get it fixed right the first time without guessing and throwing parts at it, increasing the time to repair, customer dissatisfaction, and cost. The appliance repair trade is probably worse off than most of the other skilled trades because the apprenticeship programs are practically non-existent, there are not many cost-effective training venues left today, and appliances have become increasingly more complex and computer-controlled. So you’re left with a double-whammy: the technical skills have gone down at precisely the time they’re needed the most as appliances have gotten more complex to troubleshoot. As I mentioned earlier, one of the biggest skill gaps in the appliance repair trade today is a working knowledge of basic electricity, circuits, and using schematics to troubleshoot electrical problems. I call this Circuit Fu. And this is exactly what we teach in the Fundamentals of Appliance Repair online training course at the Master Samurai Tech Academy. 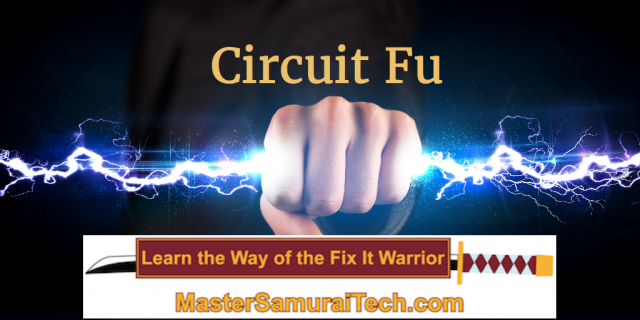 Appliance technicians come to the Master Samurai Tech Academy precisely to learn these lost Circuit Fu skills, even experienced techs with previous appliance repair training. The Fundamentals of Appliance Repair course is equally effective as a getting-started course for a rookie or a filling-in-the-gaps course for an older appliance tech. Team Samurai helps to get you from where you are to where you want to be! The appliance repair training at Master Samurai Tech is all done online and is self-paced. Work on your course on your schedule, go as slow or fast as you want, review as often as you need to. The courses are multimedia and rely heavily on videos as a teaching medium. And if you need additional instruction, that’s just a click away in the Student Forums. Or, come to the weekly, live web instruction where you can ask questions real-time. Begin your journey towards Circuit Fu mastery!